No writer wants it to happen, but it’s inevitable in the electronic age: your work will get stolen. While some thieves will steal your work only for their personal use, others will distribute it on the Internet through “free” piracy sites, and yet others will have the gall to sell your work through legitimate distributors like Google Play, iBooks, and Amazon. 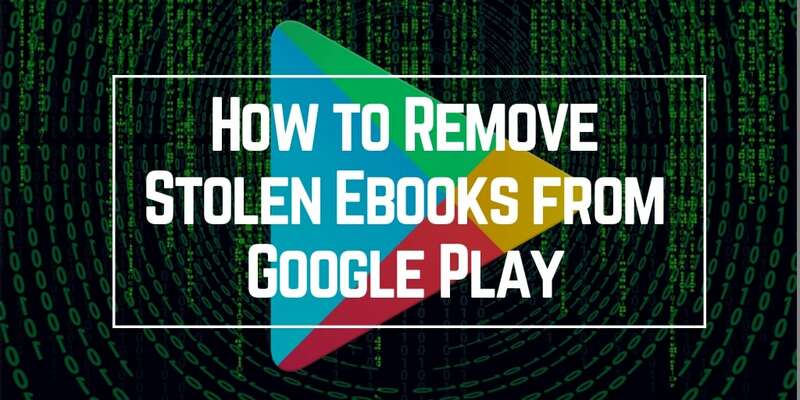 In this first tutorial in an ongoing series, I’ll show you how to get illegal copies of your ebooks removed from the Google Books and Google Play Books. I’m not starting with Google Play for any particular reason. While in past years they have had a horrible problem with piracy, they have clamped down on it in recent years and have gotten a lot better about screening and booting sellers who cheat. Unfortunately, thieves still manage to sneak through—they do in most ebook stores. The only way to get them removed is by removing them. This involves downloading ebooks through legal or illegal means and then distributing it for free or for profit without permission of the copyright holder. Pirates may slap a new cover on the e-book and change the name of the author. Sometimes they put the text of the book through a synonym-generator in attempt to circumvent copyright law. (It’s still plagiarism). However, pirates are just as likely to sell the book with the original text and author’s name intact. In this type of theft, publishers distribute a work in violation of the contract terms they have with the work’s writer. For example, a publisher who has an agreement to sell a certain title for three years and continues to sell the work without the writer’s consent, in violation of the contract, is engaging in contract theft. I am one of the many writers who was affected by the sudden closure of Torquere Press LLC last year. Despite closing the business and relinquishing rights to most of the works it had published, the former owners continue to offer dozens if not hundreds of ebooks for sale on sites like Google Play Books and Amazon. Any money from sales of these books goes to the former owners of Torquere; the writers don’t see a penny. This is also contract theft. 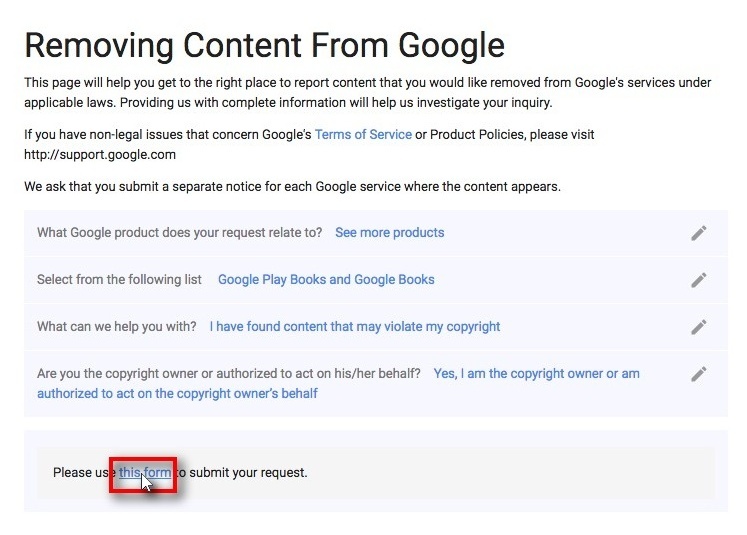 Whether you are a victim of piracy or contract theft, you can request to have the infringing books removed from Google’s sites and stores. Just to be clear: if your book was stolen, it is a copyright violation. Under U.S. laws and the laws of most other countries, the creator of a work automatically holds the copyright. You don’t have to register the copyright with the U.S. Copyright Office—you own the copyright regardless. The only way you can give up the copyright of a work you created is by signing it away in a contract. Standard publishing contracts do not take away your copyright. I have contracts with more than a dozen publishers, and none of those publishers own the copyright on my work. They have not bought the rights to my work—they have bought the right to publish my work. I owned the copyright before the copyright was signed, I own it while the contract is in effect, and I will own it when the contract is over. You have the legal right to enforce your copyright. So let’s get into the nitty-gritty of how to do this with Google Play Books. Find out which of your books are on Google Play by searching at https://play.google.com/books. In a text or note-taking document, paste the titles and URLs of any unauthorized copies. 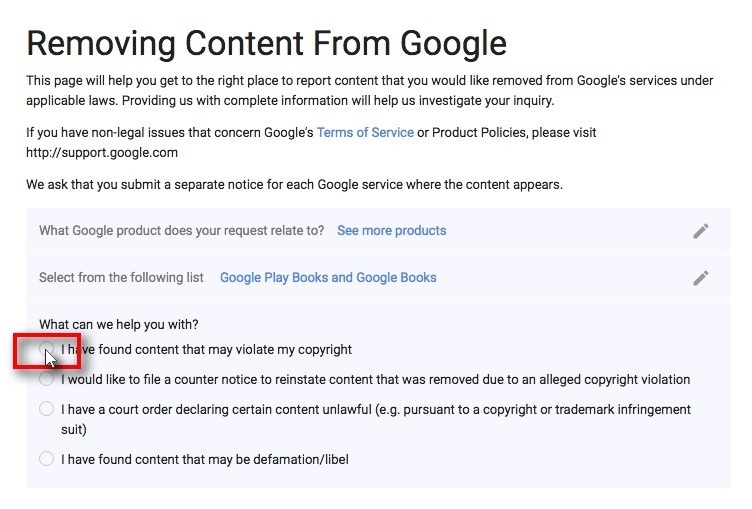 To request removal from a pirated or contract-violating book from Google Play Books or Google Books, go to https://support.google.com/legal/troubleshooter/1114905?hl=en#ts=1115658%2C1115668. You’ll answer a questionnaire that will lead you to the correct form to fill out. This form is easiest to use when you’re dealing with only one or two violations. That’s because the form limits the number of violations you can report. 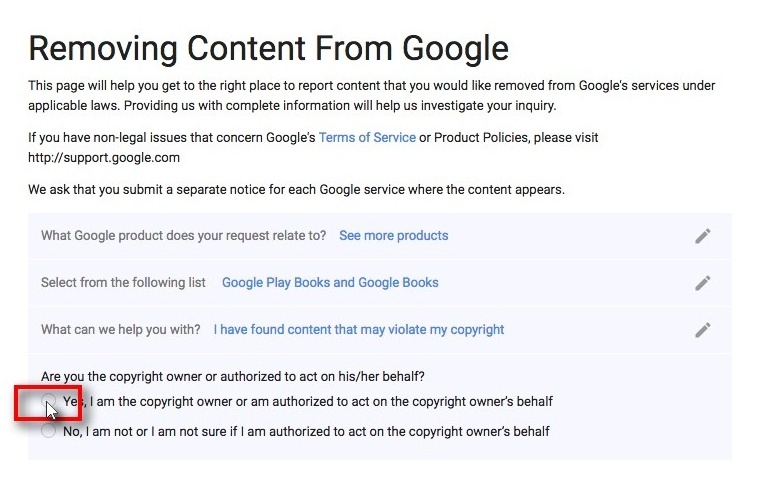 If fifty pirates are selling copies of one of your titles on 50 different Google Play URLs, you can report them all on one form. But if one pirate has stolen 50 of your titles, you have to file a different form for each title. Does it make sense? Not really. But the good news is that email exists. If you need to report multiple violations, send an email. 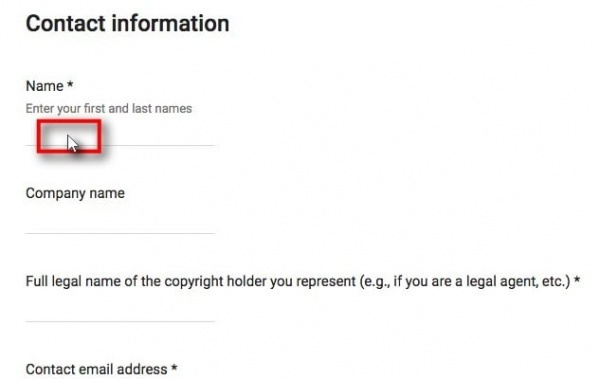 You can use Google’s Report Alleged Copyright Infringement form as a template or try a handy tool like the DMCA Notice Generator. However, beware that much of the information you communicate may be made public. Read Privacy Notice below. Note: Double-click on any image in this tutorial to enlarge it. Step 3: Select See More Products. Scroll to the bottom of the list and click the circle next to See More Products. Tip 1: The list is long, but items are generally listed in alphabetical order, so hopefully that will make it easier to find. Voila! The item you’re looking for will be highlighted just like it is in this screenshot. Reminder: You can double-click on any image to enlarge it. It also asks for some optional information. Google does not specify, but it appears this can be your legal name or the name you publish under. This name may be made public. 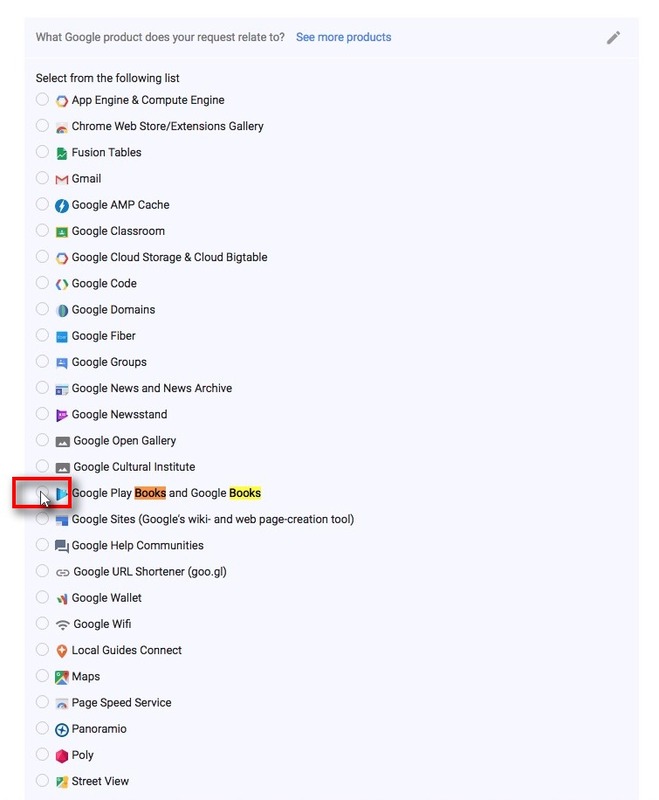 Google sends all takedown requests to a public database called Lumen. They remove your street address, email, and phone number (if you provided them) from the file that appears in the public database, but the name you use while filling out the form may appear in the file. See Privacy Notice below for more information. You can enter your company name if you have one. Doing so is optional. Google accepts business names as legal names. If you represent Disney and are filing a claim on the use of scenes from Disney’s Aladdin, you enter the name of the Disney company on the form. If you are filing on behalf of another person/entity, use the pen name, legal name, or company name of the person/entity you are representing—whichever they published their work under. If you are filing on behalf of yourself for works written under your legal name, enter your legal name. If you are filing on behalf of yourself for works written under a pen name, in most instances, you should use your pen name. Possible exceptions are if you registered your copyright under your legal name without mentioning your pen name, or your publisher attributed the work to your legal name within the book itself. Whatever name you choose, it may be made public. See Privacy Notice below for more information. Enter your email address—not mine! Thankfully, Google doesn’t ask for your street address, but you must list your country of residence by selecting from a drop-down menu. 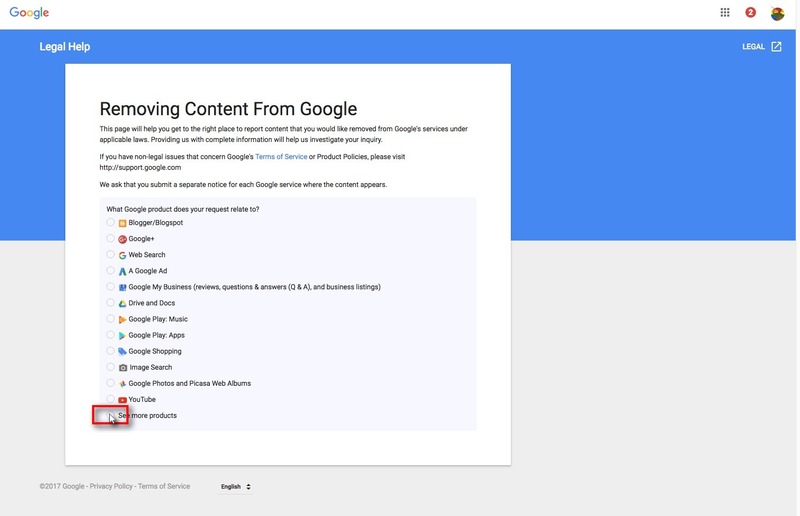 Next, Google asks for information to help identify the copyrighted work. Under Identify and describe the copyrighted work, a general format you can follow is “[Title] is a [short story/novella/novel] of # words.” I provided a few more details in my example, but they aren’t strictly necessary. This question annoys me, because it requires an answer even though lots of copyrighted works are not readily available via the web. But there is a way around it if the only legitimate copies of your work exist in a file drawer somewhere in your house. Ignore the second sentence. The form accepts only URLs (webpage addresses). It will not accept notations about page numbers. Trust me—I’ve tried adding them, and without fail it’s told me I have to remove them in order to submit the form. If you honestly believe your copyright is being infringed, you can check the first statement. You’re not swearing that every lawyer ever will agree with your claim. Rather, you’re stating that you think your case would hold up in court. If you wrote the work in question and did not sign away your rights to it, go ahead and confirm that second statement too. Again, you generally own the copyright even if your work is being published through a traditional publishing agreement. You can use the same information and language that’s on the form, but replace “swear” with “affirm,” and you’re good to go. Please note that a copy of each legal notice we receive is sent to a third-party which may publish and annotate it (with your personal information removed). As such, the content submitted in this form will be forwarded to Lumen (http://www.lumendatabase.org) for publication. You can see an example of such a publication at http://www.lumendatabase.org/dmca512/notice.cgi?NoticeID=861. 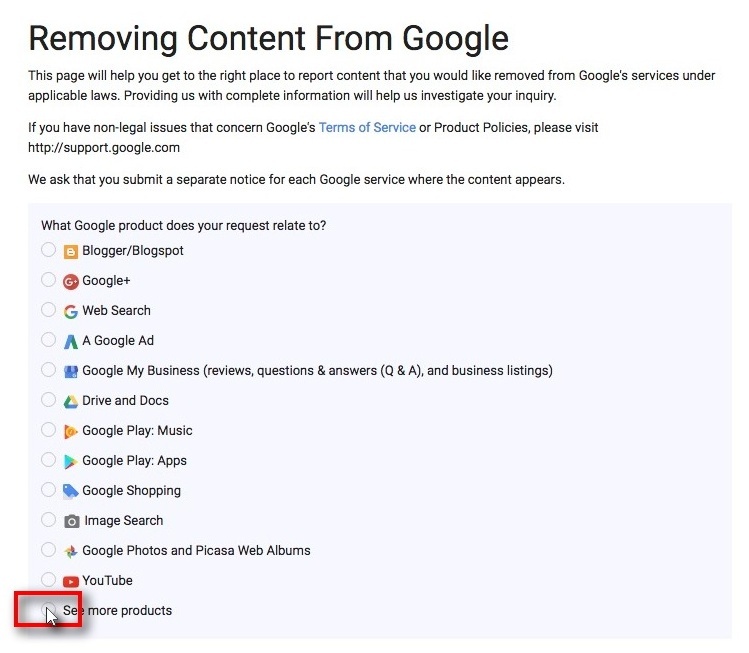 For products like Google Web Search, a link to your published notice will be displayed in Google’s search results in place of the removed content. In the linked example, Lumen has removed the email address of the complainant, but not the name of the legal agent, the company name, or the company’s general location. If you have concerns about private information being revealed in the Lumen database, fill the form out accordingly. Note that the Internet form does not ask for your physical address, so this information will not appear in the Lumen database. Your signature must match the name you entered in Name* above. Google will tell you if they accepted the form. If they don’t accept the form, they’ll highlight areas where they want you to fix things or provide more (or less) information. Screenshots and post created with StepShot Guides. Google said they’d email you if they decide your complaint is valid, but they probably won’t. I’ve never gotten any follow-up from them. I’ve just seen my stolen books removed from their store, usually within a week or two. If your books are still up after a few weeks, it’s definitely worth sending them a follow-up email or another takedown notice. I hope you found this post helpful! Please share it with your writer friends. If you’d like to show your appreciation for this post and help keep the lights on at the Lowry blog and house, please consider throwing a dollar or two in the tip jar. Do you know what else GooglePlay won’t do? They won’t tell you how much money thieves have made off your work, nor will they reimburse you, nor will they assist in any shape or form to persue legal prosecution against the thieves. GooglePlay actively tried to dissuade me from persuing my DMCA takedown, stating it would effect users who had already purchased those titles. So GooglePlay admitted that the thief had made money at my expense. I told GooglePlay to send those who had paid for the ebooks to my twitter where I would give them the legal (AND ALREADY FREE!) titles for nothing. Anyone who paid for those books, I apologise. You were scammed, and they used my name to do it. If you had gone on Smashwords, you could have downloaded those books, legally, and for free. GooglePlay knowlingly aided and abetted a criminal. They also made money off that too.